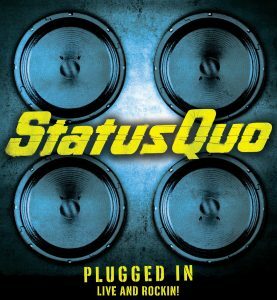 Status Quo come to St David’s Hall on Wednesday 29th November! BRITAIN’S best-loved rockers Status Quo celebrate their incredible five-decade career with a special show at St David’s Hall on Wednesday 29 November. This is truly a rare opportunity to experience The Quo in an intimate setting with their gift for classic songwriting shining through. However, the original plan for an acoustic gig has now been shelved in favour of the band doing what they do best – plugging in the electric guitars and blasting the volume up to 11! Their last visit to the National Concert Hall of Wales was in October 2004 when they blew the roof off, and they’re now set to rock the venue to its foundations once again! The last year has been the hardest year of their career. Frontman Francis Rossi and the band have faced the retirement from live performance of the iconic Rick Parfitt, who then tragically died in December. However, the ever-defiant group will return with the flag flying high to honour his memory and bring the fans what they want and deserve. In April 2017, the band announced their long-planned Aquostic UK tour, but immediately found themselves with a dilemma. The acoustic shows had been deemed necessary as the inevitable rigours of the electric set were considered to be too much for Rick. Yet, demand from fans for electric shows remained undiminished. Taking into account all changed circumstances, and the band’s movement away from the successful Aquostic albums, a decision has been made to get Plugged In with a fully electric tour. Francis Rossi said: “This has been a year like no other. In many ways the band has felt out of control. Rick’s passing was a huge blow. Much of what we had planned was envisaged initially to accommodate what would be right for him; those sands have obviously shifted. Now everything has changed. Tickets are £46.50 & £56.50 (plus an optional £1 postage fee).